Recalculate your yardage. Unless the horse with the bucket carrier was Secretariat he wasn’t going 35mph with 180# of rider and tack on his back up a hilly dirt road. Try 25mph at the most. Editor: You may well be right… or not. The horse looked like it was mostly Quarter-Horse to us, a breed named for its speed in the Quarter mile, where Quarter-horses have been timed at over 50 mph (so 35 is not pushing it, even with a saddle). If you think the 35 mph is too fast for this make-believe Hollywood scene, you can figure a new yardage using the same formula… just substitute 25/60 for 35/60 and the rest is the same. One of my favorite movies. I have no real use for a rifle like this, but I REALLY want one. Ha. I don’t own a Sharps but many at my gun club do, and they have a monthly competition at 600 yards. On one occasion, I was in the pits during a black powder 600 yard match. You could hear the bullets distinct sound as it cut the target. I liked it. Some of the groups and scores were just great. I was very impressed. I have seen some spectacular Sharps and had the honor to hold a few. I fell in love with them immediately. I had to walk away quickly before I got into yet another shooting sport. Just beautiful guns to the eye and touch. 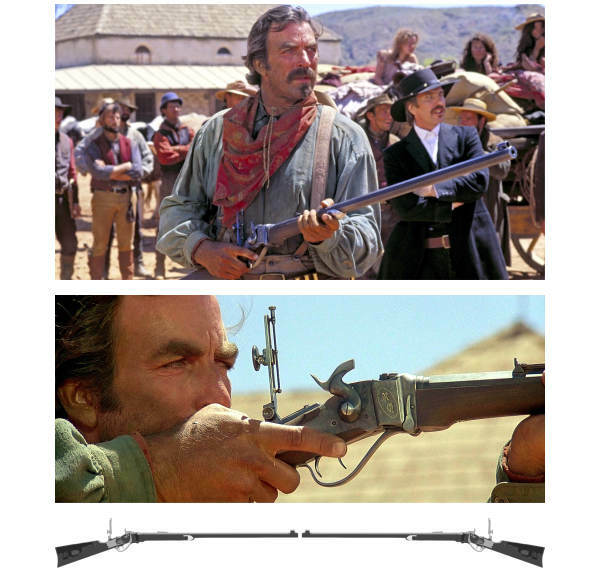 An interesting tidbit about that “spare barrel” is that it’s the aluminum barrel that was mounted to that third rifle so it could be swung controllably in the fights during the movie filming. He sent the rifle back to Sharps afterwords to have it brought up to full functioning. I’ll rest on my opinion as a licensed by N.Y, Md. and Mass.Thoroughbred race horse trainer. 180 lbs up a hilly dirt road carrying a rider standing in his stirrups for close to half a mile at better than 30mph isn’t possible. What makes the movie unreal to me is the +- 800 yds shot off hand and a quick snap offhand shot at that….. ONLY IN HOLLYWOOD.